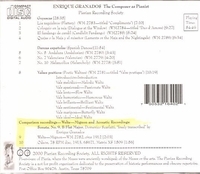 “Enrique Granados was born in Lleida, Catalonia (Spain), the son of Calixto Granados, an army captain, and Enriqueta Campiña. As a young man he studied piano in Barcelona, where his teachers included Francisco Jurnet and Joan Baptista Pujol. In 1887 he went to Paris to study with Charles-Wilfrid de Bériot and, most importantly, Felipe Pedrell. He returned to Barcelona in 1889. His first successes were at the end of the 1890s, with the zarzuela ‘Maria del Carmen’, which earned the attention of King Alfonso XIII. In 1911 Granados premiered his suite for piano GOYESCAS, which became his most famous work. It is a set of six pieces based on paintings of Goya. Such was the success of this work that he was encouraged to expand it; he wrote an opera based on the subject in 1914, but the outbreak of World War I forced the European première to be canceled. It was performed for the first time in New York City on 28 January 1916, and was very well received. Shortly afterwards, he was invited to perform a piano recital for President Woodrow Wilson. Prior to leaving New York, Granados also made live-recorded player piano music rolls for the New-York-based Aeolian Company's ‘Duo-Art’ system, all of which survive today and can be heard - his very last recordings, currently available on Pierian 0002. The delay incurred by accepting the recital invitation caused him to miss his boat back to Spain. Instead, he took a ship to England, where he boarded the passenger ferry Sussex for Dieppe, France. On the way across the English Channel, the Sussex was torpedoed by a German U-boat, as part of the German unrestricted submarine warfare policy during World War I. In a failed attempt to save his wife Amparo, whom he saw flailing about in the water some distance away, Granados jumped out of his lifeboat, and drowned. Ironically, he had a morbid fear of water for his entire life, and he was returning from his first-ever series of ocean voyages. Ironically too, the ship broke in two parts and only one sank (along with 80 passengers); the other part of the ship where his cabin was did not sink and was towed to port, with most of the passengers. They left six children.